Move over, bagel bites! There’s a new pizza for the nineties kid at heart! Inspired by Carpet from Aladdin, I made these healthy, vegetarian naan pizzas piled with veggies. Not only are they adorable, but the colors make these little Magic Carpet pizzas very Instagram worthy, and 90’s inspired! Peel 6 purple baby potatoes, and place in a pot of water to and turn the heat on high. While your potatoes are boiling (for 10-15 minutes, until tender), cut your pizza crusts. Cut two rectangles out of your naan bread. On either side, cut some fringes with a pizza cutter. Each slice of naan bread will have two pieces, spread or sprinkle cheese of choice in between each piece of naan. Dice a yellow and red bell pepper, set aside. Once your potatoes are tender, drain them and place them back in the pot. Add in your yogurt, milk, and salt and pepper and mash with a potato masher, combining all the ingredients. Spread olive oil and garlic on each of your slices of naan, and then spread your potato mixture on each slice. Sprinkle red and yellow bell pepper on each slice, and bake for 10 minutes. And there you have it! 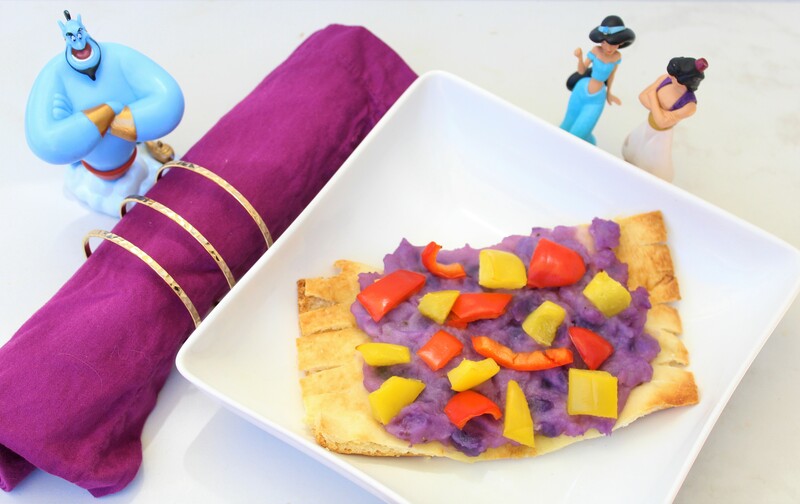 You’re ready to have little Aladdin inspired naan Magic Carpet pizzas! I find that when I make food look like it came out of a Disney movie or inspired by a Disney character, it really helps encourage my daughter to eat foods that are good for her, particularly veggies. When it comes to encouraging kids on healthy eating, so much of it comes down to how its presented!